With all the extraordinary MP3 players out there, there's simply no reason to use standard earphones, unless they were a gift, and not using them would hurt somebody's feelings, just like when you didn't wear that sweater with the reindeer on it. Clearly then, it's time to step up to Shure's SE115 Sound Isolating™ Earphones. The compact SE115 is the ideal introduction to Shure's line of high-performance earphones, evolved from technology road-tested by pro musicians and perfected by Shure engineers. Detailed, warm sound quality is achieved via the Dynamic MicroSpeaker II, a 2nd generation driver with advanced bass that'll make your favorite songs richer and more lifelike than you've ever heard them, possibly even enabling the decryption of secret backwards messages saying, "Actually, we intended for this to be played forwards". Sound isolating sleeves further the experience, blocking out ambient noise and ensuring a comfortable, customized fit, with each Fit Kit including Flex and Black Foam sleeves in sizes small, medium, and large (those with ear canals XL and larger should be out listening for earthquakes). 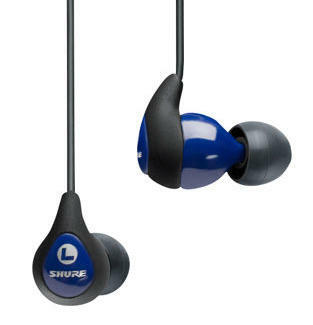 To move your sound to the next level, just grab a pair at Shure.com -- unless your computer is as unnecessarily authentic as a pair of standard earphones, which technically would mean you're reading this on an abacus.